The Crest Audio Tactus digital console utilizes the Waves eMotion LV1 mixer as its mixing engine. You can run SoundGrid-compatible plugins by Waves and other companies directly on the eMotion LV1 mixer. Both eMotion LV1 and your plugins are processed on the powerful Tactus FOH box. Now you can run Waves’ acclaimed compressors, EQs, limiters, delays, and more on Crest Audio Tactus digital consoles. 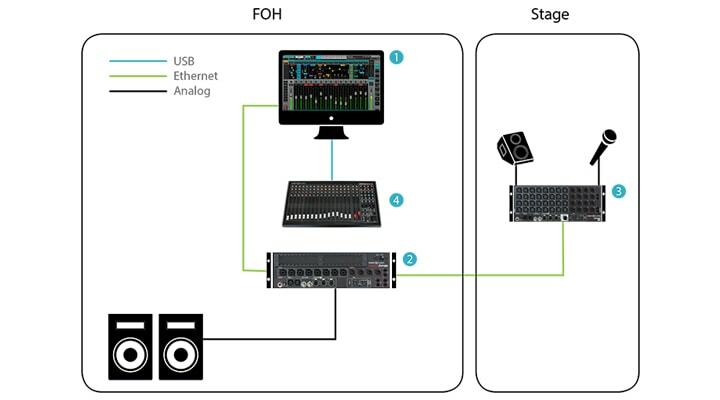 Along with the revolutionary eMotion LV1 mixer, this setup will deliver superior sound quality and convenient workflow for any front-of-house, monitor and broadcast engineer. Click on the setups tab to learn more. Host computer: The eMotion LV1 mixer, your plugins and preset files, and your SoundGrid software are all located on this computer. eMotion LV1 runs on both Mac and Windows and supports multiple displays. Tactus FOH: An I/O interface with a built-in SoundGrid server is in charge of processing the eMotion LV1 mixer and the plugins. Tactus Stage: For connecting your microphone and instruments on stage as well as your onstage monitors. Tactus Stage connects to the Ethernet switch located on the Tactus FOH via the SoundGrid protocol. Tactus Control: Control surface for the eMotion LV1 mixer. Connects to your host computer via USB. * Check the updated list of qualified Ethernet cables for connecting between your Tactus stage and FOH boxes, and your host computer. * Tactus Control is only supported with eMotion LV1 v9.14.0.423, it is not supported with eMotion LV1 v10. Tactus Stage A: For connecting your microphone and instruments on stage as well as your onstage monitors. 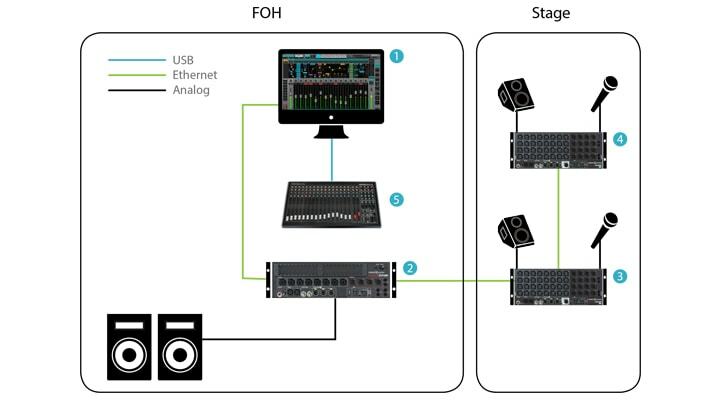 Tactus Stage connects to the Ethernet switch located on the Tactus FOH via the SoundGrid protocol. Tactus Stage B: For connecting your microphone and instruments on stage as well as your onstage monitors. Tactus Stage connects to the Ethernet switch located on the Tactus Stage A via the SoundGrid protocol. Learn more about the Waves eMotion LV1 mixer. Contact Crest Audio for more info on Tactus/LV1 mixing systems. Tactus Control is only supported with eMotion LV1 v9.14.0.423, it is not supported with eMotion LV1 v10. Contact Crest Audio for support. Crest Tactus digital mixing systems with the eMotion LV1 mixer are available from Crest Audio.